A customer in the re-bar industry was dissatisfied with their existing processing machinery. The wheels were consuming excessive abrasive per blast hour, did not provide adequate profile for coating adhesion, and were expensive to operate and maintain. At Industrial Associates, we are recognized leaders for the manufacturing and supply of high-quality blast cleaning equipment. The customer’s existing machinery consisted of four 75 HP, 24″ diameter, 1800 RPM blast wheels throwing 1,800 pounds of steel grit per minute with abrasive velocity of 240 ft./sec. These high abrasive flow rates resulted in excessive abrasive costs and extra wear of abrasive recycling components including screws and elevators. The customer required machinery that could simultaneously process up to seven 20 ‘ long sections of rebar. 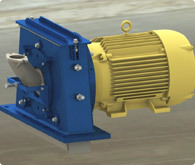 We redesigned their existing process, retrofitting their machinery with supplied equipment of four 60 HP 16″ diameter, 3600 RPM Bronco direct drive blast wheels with an abrasive flow rate of 650 lbs./min and an abrasive velocity of 325 ft./sec. This resulted in a more consistent surface profile for the post processing epoxy coating. The effect on the customer’s bottom line was immediate. Significant cost savings were realized, including electrical cost savings from a resulting rebate due to using super energy-efficient electric motors. There was a 30%-40% abrasive savings, justifying the initial project cost and allowing for the timely ROI. Maintenance costs were also lowered. This process redesign and equipment retrofitting was completed within 8 weeks, supplied to the customer in Minneapolis-St Paul, MN. For more information about this blast wheel retrofit project please see the table below or contact us directly. Reasons for Replacement The current wheels consume excessive abrasive per blast hour, are expensive to operate and maintain, and do not provide adequate profile for coating adhesion.